GUYS!! Today is the last day of my book tour. Well, kinda… we’re adding a few more dates later this summer / early fall but this is the last day for the next few weeks and I’m going to have SO much time on my hands come tomorrow. And you know what that means… I’m getting back in the kitchen and this Marinated Tomato and Burrata Salad is the first thing I’m making. I’m so pumped to get back to my weekly farmers market routine and get the summer recipes rolling. The recipes that are super easy but feature incredible produce that doesn’t need a lot of work. Things that shine on their own. Tomatoes. Peaches. Peas. I need it all in my life! Dinners are going to be pretty laid back and easy these next few months. Like super easy. 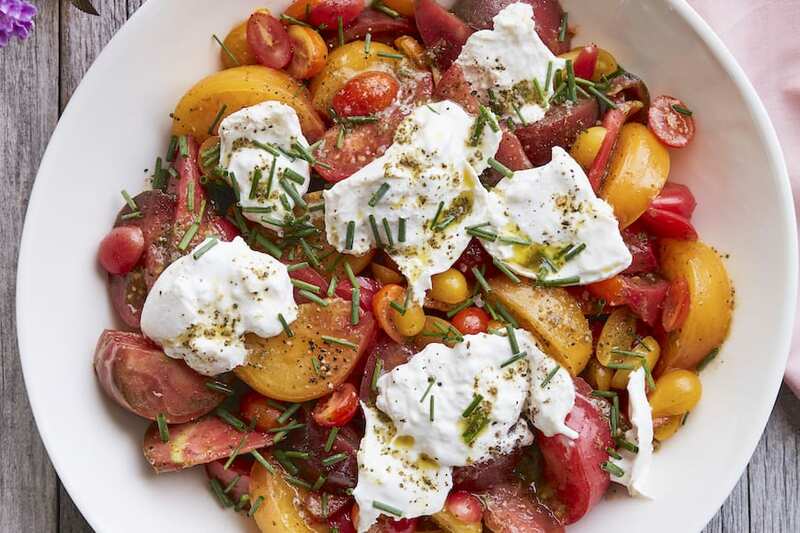 This Marinated Tomato and Burrata Salad is pretty much my latest obsession. It requires a vinaigrette that I make weekly and just keep on hand, a boat load of tomatoes and the best cheese on earth… Burrata. It’s the perfect summer salad, especially because you can find the most amazing and flavorful tomatoes at the farmers market these days. Seriously, if you go to the farmers market for one thing, it’s gotta be the tomatoes. They are infinitely better and brighter than a few months ago! And now is the time to eat ALL OF THEM. So, without further ado, here’s the best salad on earth with my fav vinaigrette. With the best cheese ever created. And while you go enjoy that, I’m going to lock myself in the gym. Combine all the ingredients in a food processor except the olive oil and whirl together for 1-2 minutes until everything is finely chopped. While the food processor is still running, stream in the olive oil until fully incorporated. Transfer the vinaigrette to a air tight container and set aside until ready to use. In a large bowl, combine the cherry tomatoes and ½ of the vinaigrette and toss to combine. Save the remaining vinaigrette for future use. Taste and season with salt and pepper as needed. Let the mixture sit for 20 minutes and then serve at room temperature with burrata on top. Only 19 days!! Yay! As you know, I became a huge fan of burrata after I was introduced to it by you. 🙂 Can’t wait to try this salad. I love burrata! This looks so good, Gaby! Congrats again…wow 19 days is going to go by quickly. I can never have enough burrata in my life… no joke. I could consume it each and every day and not be tired of it. Needless to say, I’m all over this recipe. Yum. I’ve been doing a slightly different version of this (a balsamic vinaigrette, and with fresh mozzarella) all summer. You’re right: the tomatoes are bonkers right now. This looks amazing! That dressing sounds gorgeous. You had be at burrata- obsessed!! Mazel on your wedding! This is my kind of summer meal. Now I will just add a nice slice of homemade bread, and I will be in heaven!! This is so fun! Love this idea! Oh I love burrata with a passion! Good luck with all the last minute details and save some time for decompressing before the big day. I want to dive into that ocean of goodness!! So yummmy! How exciting Gaby (although I remember how hard the seating arrangements were)! Love all the flavors in this salad – gorgeous! Yum. I have to make this. Fortunately, I need to go to the market so perfect timing to pick-up some ripe organic tomatoes. Boo to seating charts but yay to the wedding countdown! WOOT!!! How exciting!! So, so, so VERY happy for you Gaby!!! Cannot wait to see the photos and hear all about the BIG DAY!! This salad is such a great example of why I love summer foods – no muss, no fuss, just amazing taste!!! There is no better combination, but you’ve totally inspired me to try marinating my tomatoes before mixing them with burrata.YUM! Do you LOVE burrata? 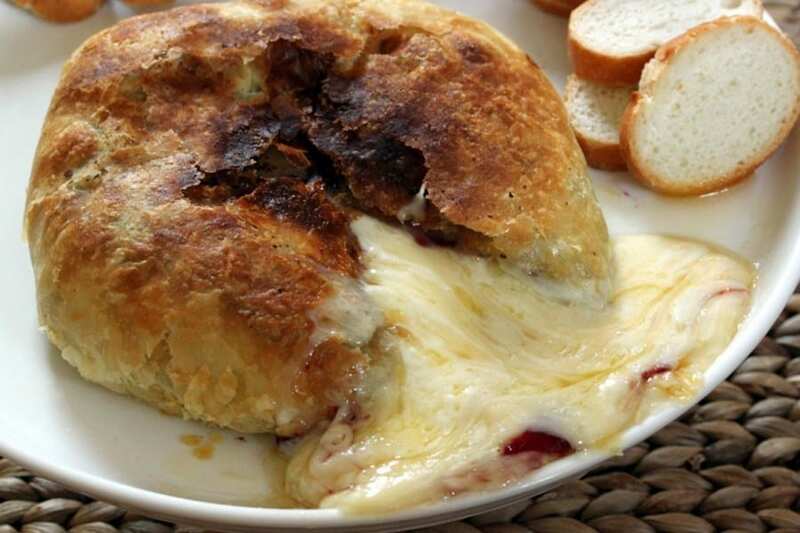 I don’t blame you, it’s so yummy and creamy…mmm. This salad looks amazing, I could eat it for days with just a good piece of bread! B. I’m in the middle of finalizing my guest list. With a few years experience doing it for others, I figured it would be soooo easy. Holy heck, having to cut it down has been the hardest thing on the planet!! Never again! I was thinking add fresh Basil, spread over garlic bread and broil till the cheese melts and get slightly toasty. Wow! This looks so delicious, Gaby! You never cease to amaze me…what a wonderful idea for a tasty salad! Thanks for sharing! Hello Summer! I am going to eat my weight in tomatoes and this salad is just the thing! 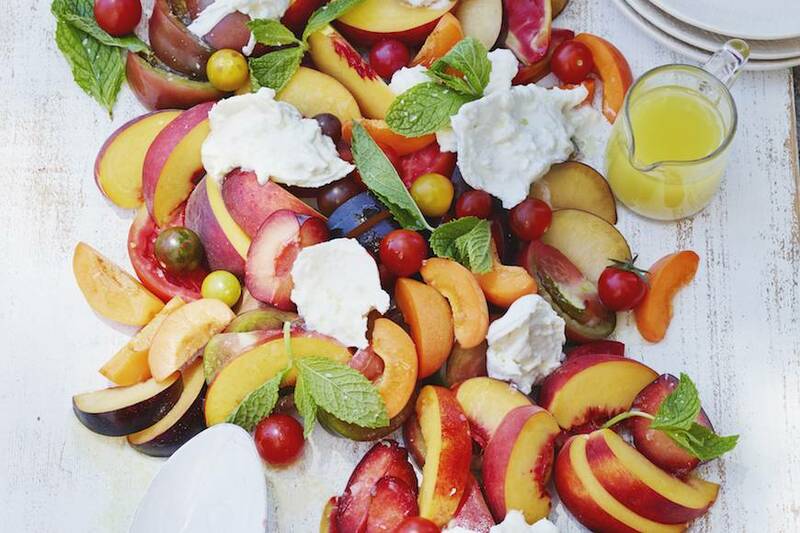 That salad is drop-dead bee-you-ti-ful, like summer on a plate! 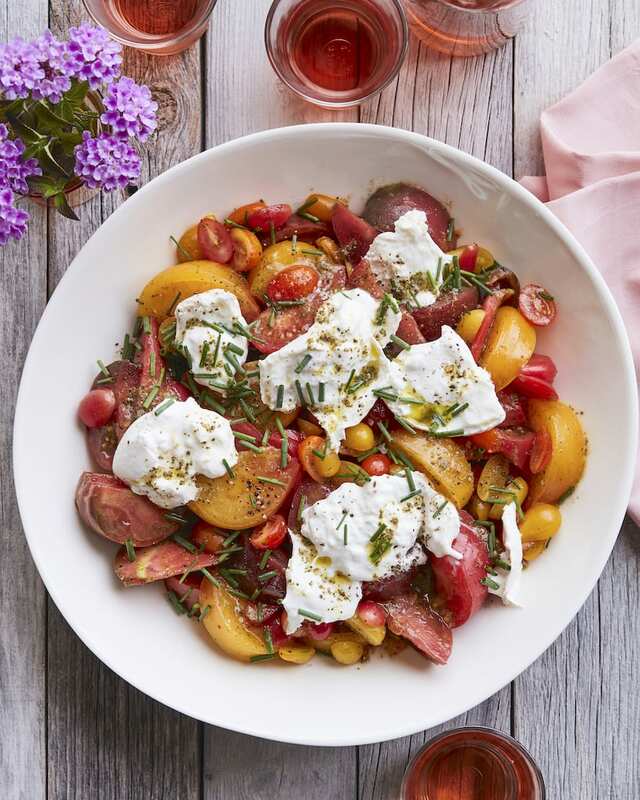 I love tomato salads with ricotta and a good slab of bread, but burrata is winning me over. This looks amazing! I’m making it this weekend. Hi! I just made the vinaigrette and was just wondering, but is it supposed to be of a mayonnaise consistency ? and when you say save the rest for future use, I assume in the refrigerator? and for how long in the fridge will it last? it’s thicker because of the cheese!! and yes, always store in the fridge for up to 5 days!